Yes, Oracle just bought the DNS provider company that brought down the Internet last month. Business software vendor Oracle announced on Monday that it is buying cloud-based Internet performance and Domain Name System (DNS) provider Dyn. Dyn is the same company that was hit by a massive distributed denial of service (DDoS) attack by the Mirai botnet last month which knocked the entire Internet offline for a few hours, crippling some of the world’s biggest and most popular websites. Since the company provides cloud-based DNS service to customers such as Spotify, Netflix, Twitter and Pfizer, the acquisition will help Oracle’s cloud customers to optimize their infrastructure costs and performance. According to the press release, the Dyn acquisition "extends the Oracle cloud computing platform and provides enterprise customers with a one-stop shop for Infrastructure-as-a-Service (IaaS) and Platform-as-a-Service (PaaS)." "Oracle Cloud customers will have unique access to Internet performance information that will help them optimize infrastructure costs, maximize application and website-driven revenue, and manage risk," said Kyle York, chief strategy officer of Dyn. The company said Dyn’s immensely scalable and global DNS is not just a critical core component but also provides a natural extension to Oracle’s cloud computing platform. So, the deal would help its cloud customers improve access and page-load speeds for their websites using internet performance information. Oracle did not disclose the acquisition amount it paid for Dyn, but a source close to the deal told Fortune that Oracle paid somewhere between $600 Million and $700 Million to acquire Dyn. 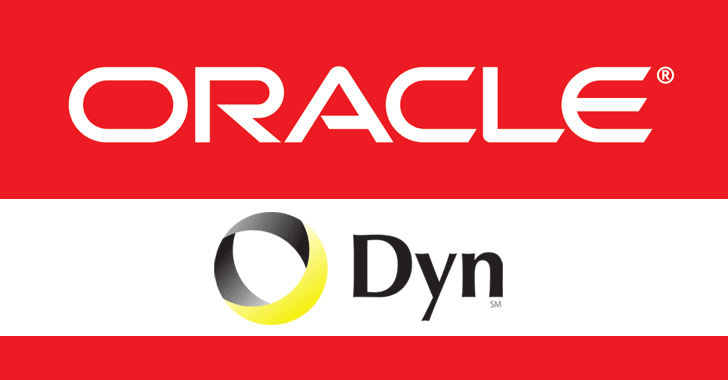 Dan Primack reported that Oracle paid around $600 million for Dyn, though Dyn has yet to respond to a request for comment. Oracle is far behind Amazon Web Services (AWS), which is the market leader in the infrastructure cloud computing market. The deal would potentially make the company compete with Amazon’s AWS and on Microsoft’s Azure – Route 53 and Azure DNS.